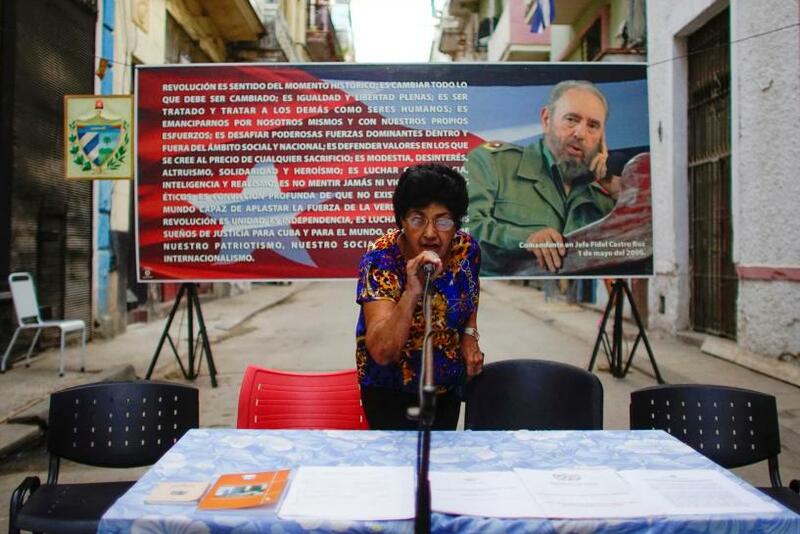 Notes from the Cuban Exile Quarter: Refusing to mourn Fidel Castro's death is punishable by prison in Cuba. Refusing to mourn Fidel Castro's death is punishable by prison in Cuba. Without any context or irony Sarah Marsh and Nelson Acosta of Reuters in their article "Cuba marks anniversary of Fidel death as post-Castro era nears" referring to Cuban despot Fidel Castro as a "revolutionary leader" reports that the dictator's "death last year plunged Cuba into nine days of national mourning." The Reuters reporters also claimed that "'I am Fidel' became a nationwide chant, as many Cubans pledged to stay faithful to the revolution he led that in 1959 overthrew a U.S.-backed dictator." However there is no mention of the Cubans arrested and still in prison today for refusing to mourn Fidel Castro's death last year. Two Cubans who refused to remain silent and spoke out on the real legacy of Fidel Castro remain in prison today. Their names are Carlos Alberto González Rodríguez and Eduardo Cardet Concepción. Seven others spent months in prison for refusing to go along or remain silent in their disdain for Castro. Carlos Alberto González Rodríguez, a 48 year old engineer, was sentenced to two years in prison after placing a poster that said "Down with Fidel" in Camajuaní, Santa Clara on November 26, 2016, one day after the death of the elderly tyrant. He was charged with a "predilection to social dangerousness" and a summary judgement was rendered against him. He is currently at the "El Pre" prison in Santa Clara. Eduardo Cardet Concepción, age 49, has spent the last eleven months arbitrarily detained in a Cuban prison. 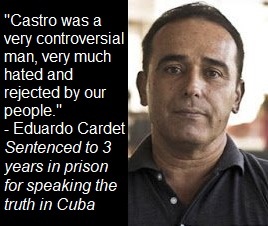 Cardet, a medical doctor, husband and father of two has been jailed for his nonviolent activism generally and specifically for giving an honest assessment of the life and legacy of Fidel Castro. 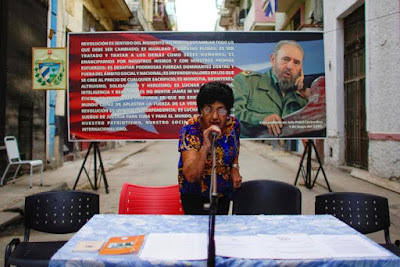 Following Castro's November 25, 2016 death, Cardet explained to a foreign journalist that "Castro was a very controversial man, very much hated and rejected by our people." On November 30, 2016 when he returned home to Cuba he was beaten up in front of his wife and children by Cuban state security and jailed. Amnesty International has recognized him as a prisoner of conscience. Eduardo Cardet is the national coordinator of the Christian Liberation Movement. [His predecessor, Oswaldo Payá Sardiñas, met with a suspicious death along with Harold Cepero Escalante on July 22, 2012.] On November 30th he will mark one year in prison. Others were jailed for refusing to mourn the death of Fidel Castro in November 2016 but were released from prison over the course of 2017. Darío Pérez Rodríguez, who refused to watch the funeral ceremony on television saying that they disgusted him, was released in October 2017. Luis Andrés Domínguez Sardiñas was arrested on November 27, 2016 and accused of celebrating Fidel Castro's death, and advocating that Raul Castro be gotten rid of as well. He is currently free but faces two years in prison for disrespect to the figure of the Commander in Chief. Cuban artist Danilo Maldonado wrote, "He's Gone" on a wall and spent two months in prison without charges. 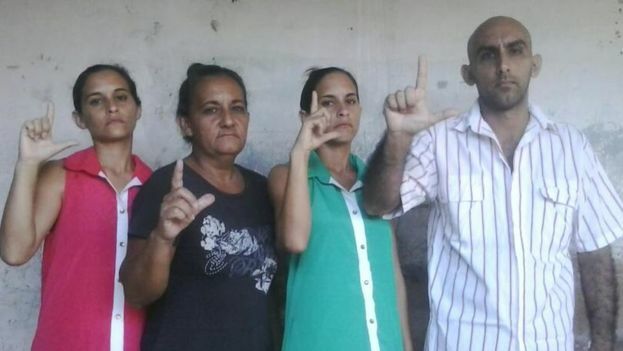 A family in Holguin made up of Maydolis Leyva Portelles and her children: Fidel Batista Leyva, and the twins Adairis and Anairis Miranda Leyva, were arrested for "defamation of martyrs of the homeland." Amnesty International recognized them as prisoners of conscience and they were released in April 2017 following a prolonged hunger strike. Hopefully, Reuters will take these facts into account before writing such glowing appraisals of how Cubans remember Fidel Castro and his legacy. If speaking critically, or refusing to attend an event to honor the tyrant invites prison how honest are those speaking positively on the passing of the dictator?